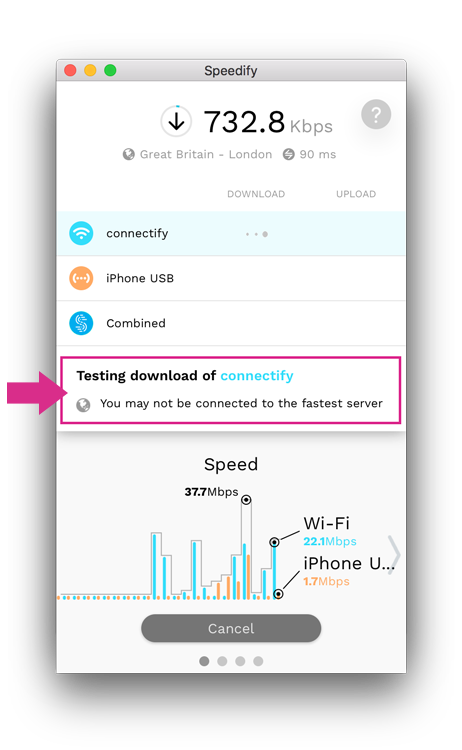 Speedify allows you to test your individual and combined connection speeds from within the app itself. In this article, we are going to show you how to test your speeds and how to interpret any messages that may appear. After connecting to one or more internet networks, tap the Test Speed button below the Speed Chart. A new pane will appear at the top of the screen. Here, you will see rows for each of your individual connections, as well as your combined connection (if you are connected to more than one internet source). These rows display the respective upload and download speeds of each connection. For example, in the above example, we see that Wi-Fi download speed was calculated to be 75.6 Mbps. 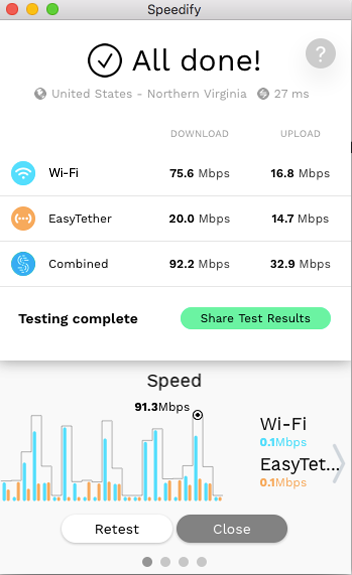 Speedify conducts the tests sequentially: it tests the download and upload speeds of each connection, before testing your combined speeds. The combined row shows just how much faster Speedify is making your internet! Be aware that the Test Speed feature uses a lot of data, so you may want to run it sparingly if you have a limited data plan or if you are using a free Speedify Plan. Why wasn’t my connection used? Sometimes Speedify doesn’t use your connections when testing your speed. In these cases, we will display messages in the Test Speed pane. The connection row that is not being used will also display crosshatching. Below, we explain why this may happen. [Connection name] is set to Backup priority. [Connection name] is over Daily/Monthly Limit. A disabled connection will not be included in the test. You’ll have to enable the connection in Connection Settings if you would like to include it. Can't connect to [Connection name]. Your connection was not used because Speedify could not connect to it. Most of the time, the tests will execute successfully, but there are certain conditions that may inhibit performance. [Connection name] was too slow to increase combined performance. 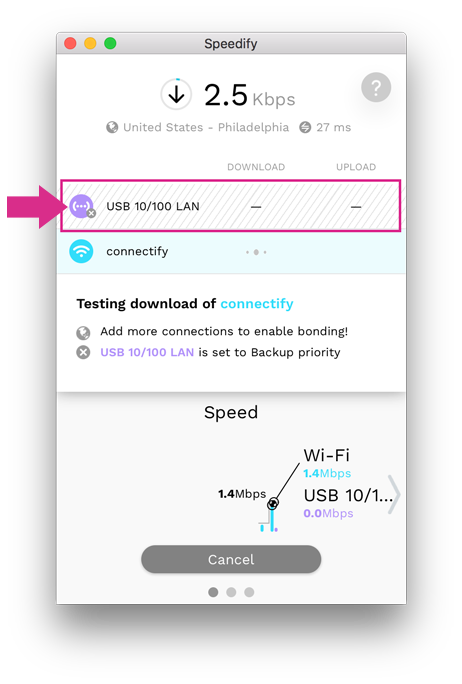 With its intelligent bonding technology, Speedify detects when one of your connections is so weak (relative to your other connections) that it will detract from your overall speed. In these cases, Speedify will not include this connection in your combined test. Speedify is in Redundant Mode. Switch to Speed Mode for faster speed. Redundant mode is best used when you need maximum reliability, but it won’t provide the highest speeds. Click here to learn how to change Speedify modes. Add more connections to enable bonding! If you are connected to only one internet source, you will not see a “Combined” value in the Test Speed pane. This is because you need a minimum of 2 connections to bond. Learn how to add connections on PC or Mac in these articles. You may not be connected to the fastest server. Speedify is fastest when you are connected to a server located near you. If you have switched to a server that is far from you (for instance, if you are in the US and wish to use the torrent-friendly Amsterdam server), you may notice a speed decrease. Click here to learn how to change servers. Using backup connections because there are no other active connections. If you have no connection set to Always or Normal priority, Speedify will use your Backup connection(s) during the test. Skipping individual tests for backup connections. Speedify will ONLY use your backup connections during the combined test if there are no Always or Normal connections. However, Speedify will not run individual tests on these connections, because backup connections are often expensive. [Connection name] is Rate Limited to [#Mbps]. You have manually limited one of your connections to a lower rate. Speedify will still perform the test, but you may not see the connection’s maximum speed. You can learn how to change this setting here. [Connection name] wasn't used during [Test Step] because [Always Connection Name] was fast enough. Speedify is cost-aware. If it sees that your Always connections are sufficiently fast, it won’t include your Normal connections. Speedify does this to conserve data usage for expensive connections when they won’t provide a significant speed boost. Sometimes, things don’t work quite as expected when testing your speeds. When this happens, you will see messages appear in the Test Speed pane explaining the problem. [Connection Name] failed during test. Your connection has failed in the middle of a test. It may still be used in the combined test if it becomes usable again.